Senate Republicans on Wednesday used a controversial procedural tactic called the "nuclear option" to change chamber's rules to make it easier to confirm lower-level Trump nominees. The effort, led by Senate Majority Leader Mitch McConnell, comes after Republicans failed to adopt a resolutionto change the chamber's rules so that non-Cabinet level executive and district court nominations would face only two hours of floor debate rather than 30 before a confirmation vote. That resolution received only 51 of the 60 votes required for adoption, along party lines. "This systematic obstruction is unfair to our duly elected president and, more importantly, it is disrespectful to the American people who deserve the government they elected," McConnell said Wednesday before the vote on the Senate floor. "We cannot set this new precedent that the Senate minorities will systematically keep an administration understaffed down to the least controversial nominees anytime they wish somebody else had won the election." Senate Minority Leader Chuck Schumer said before the floor vote. "I am sorry, so sorry, my Republican colleagues have gone along with Senator McConnell's debasement of the Senate. To do this for such blatantly political ends is simply unworthy of this institution." 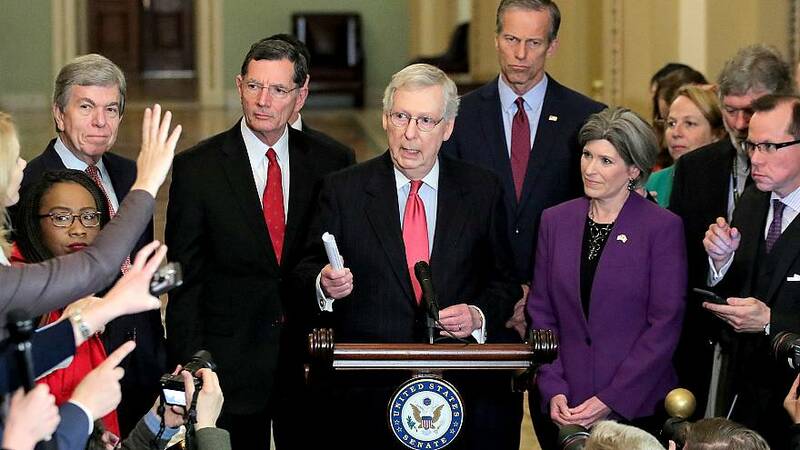 McConnell's move marks the third time in six years that the majority party employed the procedure to overcome minority opposition, allowing an action previously subject to a filibuster, and thus a 60-vote threshold, to pass with a simple 51-vote majority. In 2013, Democrats used the move to eliminate the 60-vote threshold to confirm executive branch and non-Supreme Court judicial nominations under President Barack Obama. Republicans did the some to clear the way for Supreme Court nominations, confirming Neil Gorsuch to the high court in 2017 and Brett Kavanaugh last year. The move is expected to last hours process because Republicans first changed the rules once for sub-Cabinet level executive branch nominees and planned to do it a second time for district court judges. Democrats opposed the move, arguing it would reduce the role of debate in the Senate and diminish the minority party's power, making its operations more like those of the House. Sen. Patrick Leahy, D-Vt., on Tuesday called it a "short-sighted, partisan power grab" and "an erosion of the Senate's" advise and consent role. McConnell said Tuesday that the move was necessary to bypass what he calls "systematic obstruction" by the Democrats. McConnell has made confirming judges nominated by President Donald Trump a priority during Trump's first term. The rule change will also help Republicans confirm other Trump nominees who have yet to receive a full Senate vote.